As he ran toward the airplane, 1st Lt. Charlie Thomas had a kind of wild-eyed look on his face. The blast of air from the plane’s four huge turboprop engines didn’t cause it. It was the type of gaze only a boost of adrenaline can produce. Once on the MC-130 Talon’s open ramp, he turned and looked back. A hundred yards away, an ambulance came down one of the narrow roads at Bagram Air Base, Afghanistan. It trailed a cloud of dust as it headed toward the plane. On the ambulance that sunny Sunday morning was a wounded U.S. Special Forces troop. He’d been hurt the day before in a fierce battle with al Qaeda and Taliban fighters in the Shah-e-kot Valley in eastern Afghanistan. Thomas looked inside the Talon. He was glad to see the plane was ready to carry litter patients and that six medics were aboard. Just as he had ordered. “Looks like everything’s good to go,” Thomas yelled into the loadmaster’s ear. The burly, M-16-toting “load” nodded and gave him the “okay” sign. They’re all yours now. Take good care of ’em. The men were now out of his hands, so Thomas left the plane. A hundred yards from the Talon, he stopped to watch. As it taxied away, he smiled. Since Thomas, a senior flight nurse, was exactly where he wanted to be, doing exactly what he wanted to be doing. I’m deployed where the action is. Right in the middle of the war on terrorism — getting to do my part, and that’s a rush. The Talon, from Duke Field, Fla., flew the soldiers to Karshi Khanabad, Uzbekistan. It was the second leg of a long journey that started with a helicopter ride from the battlefield. From “K-2,” the troops went to the hospital at Incirlik Air Base, Turkey. Then a C-9 Nightingale flew them to Ramstein Air Base, Germany. From there they went to nearby Landstuhl Army Regional Center for further treatment. And, later, to a stateside hospital to recover. Their journey home began with Thomas. One of three flight clinical coordinators at Bagram, his job is to help set up aeromedical evacuations. He asked for the airlift and made sure the plane arrived with the equipment, medicines, and medics needed to handle the patients. Our job is to get patients to the next level of care. Thomas is with the 137th Aeromedical Evacuation Squadron of the Oklahoma Air National Guard. Called to duty after the Sept. 11 terrorist attacks, he has spent most of his six-month tour at Bagram. He jumped at the chance to serve in Operation Enduring Freedom. Thomas’ job is one most people don’t picture a nurse doing because it deals with flight operations. That job and others take nurses away from their more traditional place at a patient’s bedside. For some nurses, like Thomas, it’s a welcome change, a chance to experience a part of the Air Force with which nurses seldom have contact. But when they trade in their hospital whites for green flight suits, some nurses miss providing one-on-one care. Sometimes you don’t see the difference you make because patients are with you for such a short time. Still, there’s no shortage of applicants for flight nurse duty. On the contrary. Though the Air Force has problems recruiting and keeping nurses, it has no shortage of flight nurse volunteers. Due to some 3,800 nurses in the Air Force, there are less than 200 authorizations for flight nurses, Capt. Linda Odom said. She’s an active duty critical care flight nurse who serves with Vo. “Flight nurse jobs are highly prized — there’s a lot of competition to get one of the slots,” she said. 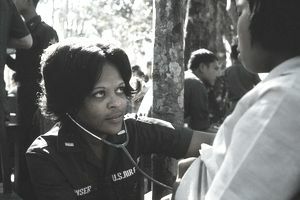 A 12 and one-half year vet, Odom’s one of her unit’s 32 flight nurses. Odom, like Vo, serves on an aeromedical evacuation crew. The crew cares for patients en route to and from hospitals. At Ramstein, the evacuation duty falls on the C-9 Nightingale. It’s a huge responsibility, she said. Few nurses in military or civilian hospitals do that. At Incirlik, Capt. Michelle Maybell makes other types of decisions. She’s a crew manager and has a different focus. Instead of patients, the senior flight nurse takes care of fellow medics. We have a group that takes care of all the needs crews have so they can keep their mind on their mission. They have to think about their patients. Not about getting equipment and medicine, or how they’re going to get back to their rooms. A reservist with the 315th Aeromedical Evacuation Squadron at Charleston Air Force Base, S.C., Maybell deployed to Incirlik shortly after the Sept. 11 attacks. A volunteer, she joined the 43rd Expeditionary Aeromedical Evacuation Squadron. As a crew manager, she learns one more part of a flight nurse’s job. It’s a responsibility she doesn’t have in her civilian job as a trauma nurse coordinator, but one that will help her do that job better. And though she’d rather be flying, what she does is a “feel good” job. When I alert crews, pack them up, launch them, and go back to help them unpack after a mission, it gives me a good feeling. A sense of accomplishment. When the soldiers Thomas put on the Talon at Bagram were ready to fly from Incirlik to Ramstein, it was Maybell who got the medics ready to fly with them. “I know we did our part to make that mission a success,” she said. While Europe, the Middle East, and Asia Minor are where the action is these days, flight nurses serve around the world. Their job — and that of active duty, Reserve and Guard flight surgeons, aeromedical technicians and flight crews — is to provide patients expert care in the air while en route to a hospital. That’s part of providing service members, Defense Department civilians and their families the level of care Americans expect, Lt. Col. Kirk Nailling said. The 86th’s director of operations and chief nurse, he said nurses play a key role in that process. We have plenty of people on the ground around the world who can do on-the-spot life-saving procedures. But then it’s our job to get them to more definite care. Operation Enduring Freedom is proving that. Each one of the American troops hurt in the fighting in Afghanistan has had a nurse at his side on the plane ride to the hospital. At times like that, nurses and medics bond. That was the case on the first evacuation from Incirlik to Ramstein of troops wounded in Afghanistan, Capt. Brenda Parker said. Another Ramstein flight nurse, she was the medical crew director on that flight. It was camaraderie, cohesiveness, and communication at its best. I’ve never seen such teamwork. Thomas emerged from the tiny cubbyhole of a room where he and another nurse called home. It was in the dimly lit and dank cellar of Bagram’s Soviet-built control tower. He rubbed the sleep out of his eyes because in a few minutes more wounded were arriving. He met all the wounded. It was the only way he could see first hand how badly they were hurt. That was the first step in figuring out what kind of evacuation to coordinate. And as doctors treated or patched up the wounded, Thomas found a way to get them out of Bagram. His reward was seeing the wounded leave the base, headed for a hospital and then home. To him, that alone was thanks enough for doing a job few — if any — people know about. These guys put their lives on the line for us. Serving them is a thrill. And taking six months out of my life to do that is a small enough sacrifice in comparison to what they do.